Corrotech designs most advanced and efficient hot dip galvanizing plants. The designs are fuel efficient, laid with most practical layout, easy to maintain, productive and equipped with innovative material handling systems. Corrotech executes all projects that are professionally managed by a dedicated project team with a director taking personal responsibility for the smooth running of each project. The key management people have more than 21 years of experience in galvanizing industry that included design and installation of the galvanizing plant, operations management, and had delivered proven performance in managing cost, productivity and environmental needs We execute projects that involve all elements of the project life cycle from project start, right through the detailed design and installation. The project supply includes plant layout and design, supply and installation of galvanizing furnace, dryer, state of the art pre-treatment tanks (degreasing, pickling, rinsing and fluxing), fume extraction systems for acid and zinc, flux recovery system, flux heating system, post treatment tanks (quench and passivation) and the project management of third-party equipment. Our team is able to meet the customer needs for the galvanizing industry, operating processes and equipment supply. 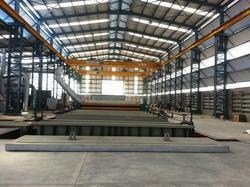 We do the full range of functions to engineer and construct the galvanizing plant as a turnkey job. We follow a flexible approach when tackling the varying client’s demands of turnkey projects. As a strategy we cultivate “Value Added Partners” to supplement and enhance our skills, as well as to cover specialist design or services. This allows us to offer our clients the full process and financial benefits of the ‘best in class’ technology available. Our extensive experience across galvanizing industry generates new ideas and adopts best practices. It is our motto to continue to develop and expand the scope and depth of our project capabilities, and to realize our full potential as a company.